So here goes – My hospital has, what is known as, a Level 3 Newborn Intensive Care Unit (NICU). This means that the smallest babies can be born there. 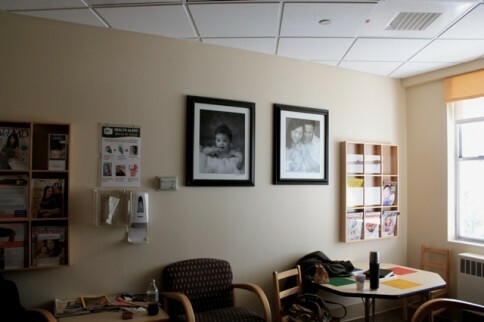 Very often, we go to outlying hospitals to pick up moms who are either too ill to be cared for at the hospital or who are at risk to deliver a preterm baby that is too small to be properly cared for there. A few days ago I went on a “transport” to pick up a mom at a hospital that is actually very close to my home. The ambulance picked me up in San Francisco at CPMC (California Pacific Medical Center) and we drove over the Golden Gate Bridge back to Marin to pick her up. We got the mom settled on the stretcher and we were heading out of the unit; the mom, myself, and the EMTs. As we were rolling down the hall, I just happened to look into the waiting room. Suddenly, I screamed. No, actually shrieked is a better word! Completely and unabashedly. Perhaps not my most professional moment. Because there, hanging on the waiting room wall was a very large photograph of a beautiful baby. My baby. 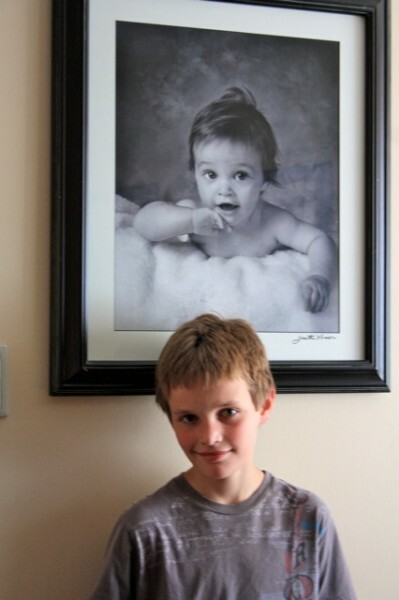 Ten years later, a photograph that was taken of Alexander at 9 months old was hanging on a hospital wall. A hospital he has never set foot in. Apparently the photographer who took his picture was using it for advertising. The next day I told Alexander that I had a surprise for him. He blushed sheepishly when he saw it. His mother (me) then completely tormented him by asking the people sitting in the waiting room if I could take a photo of him under it. They all loved it. It was just the sweetest, most random moment. There really aren’t enough of those. This one we’ll both remember forever.